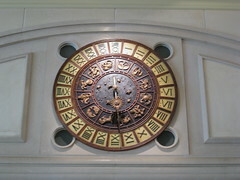 This clock is on the wall of a hotel in China. It looks like a ‘homage’ to the famous clock at St Marks in Venice. Thanks to laisuncom for the photograph.